My journey on the PeruHop bus brought me to Arequipa for the main mission of visiting Colca Canyon. 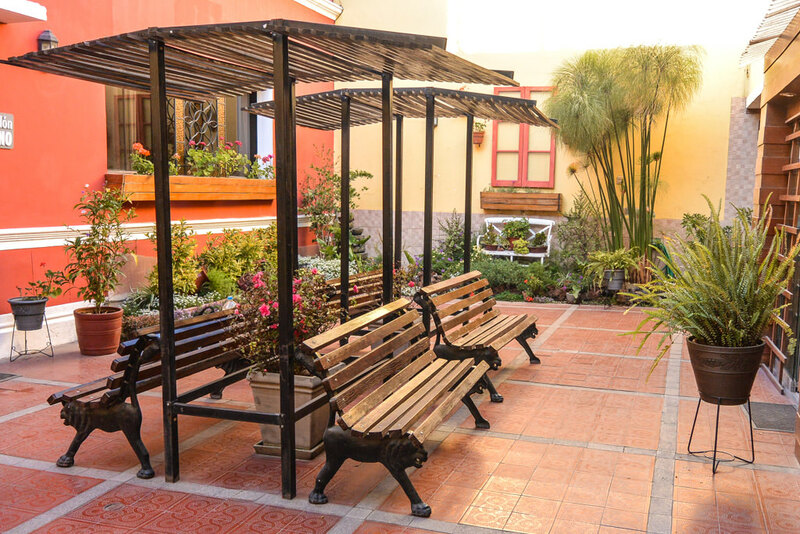 Unfortunately, I only planned a one-night stay in the city itself, and immediately regretted my choice – Arequipa deserves SO much more time! I arrived to my accommodation, Hotel Casa de Avila Arequipa, after a two-day, one-night tour through Colca Canyon. I was suffering terribly from altitude sickness. 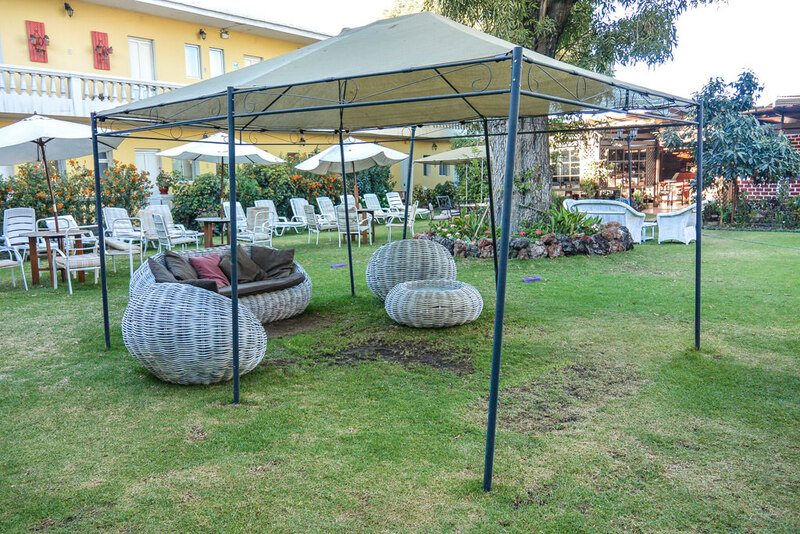 Luckily, while I’d made a terrible choice to rush into the tour without acclimating, and another terrible choice allotting too little time to explore Arequipa, I made an amazing decision in deciding to stay at Casa de Avila Arequipa. 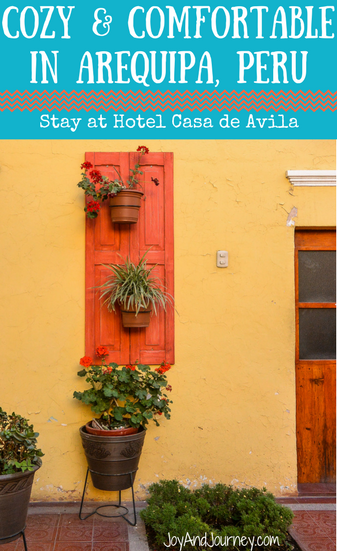 Rooms at Casa de Avila start at just over $50 per night. 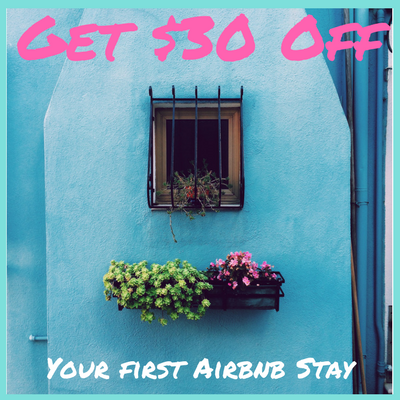 This rate includes breakfast, free wifi in the room and common areas, hot water, cable TV, and a private bathroom. 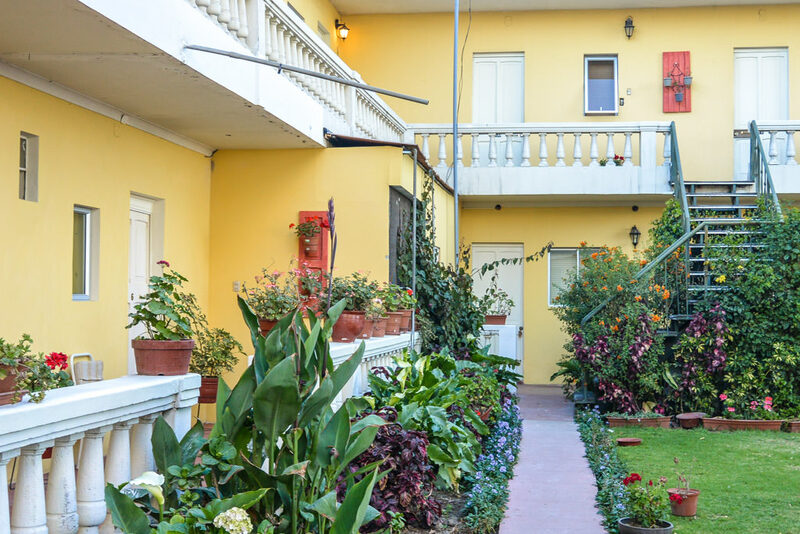 The entire hotel is bright, cheery, colorful, and flower-filled. 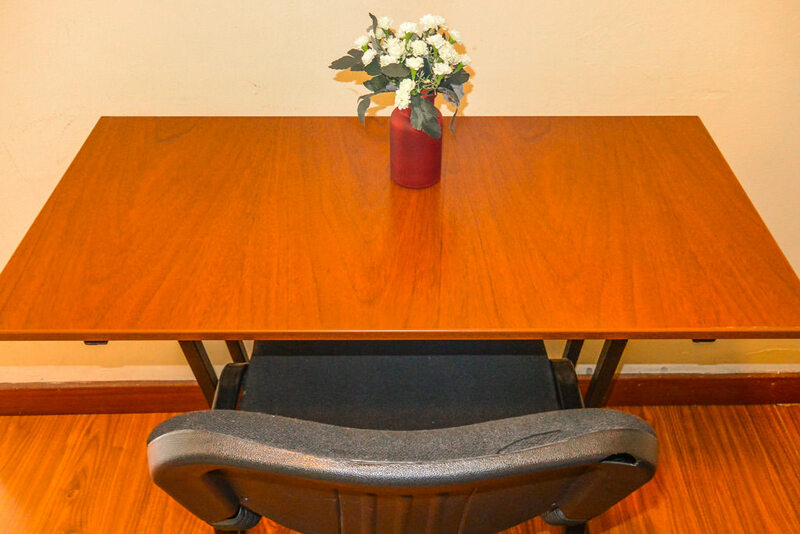 It’s basically impossible to beat this price for a private room of this quality with such a convenient location in Arequipa! 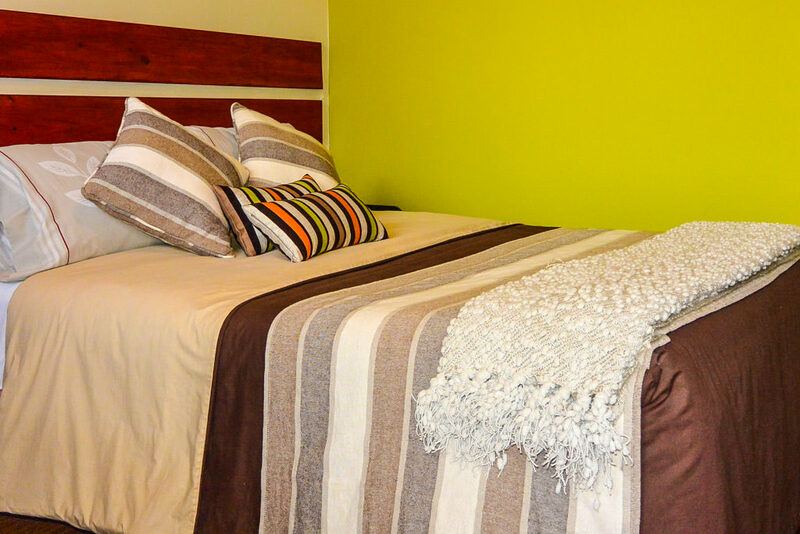 Casa de Avila is an awesome choice if you’re looking for a quieter, calmer experience as compared to a hostel. 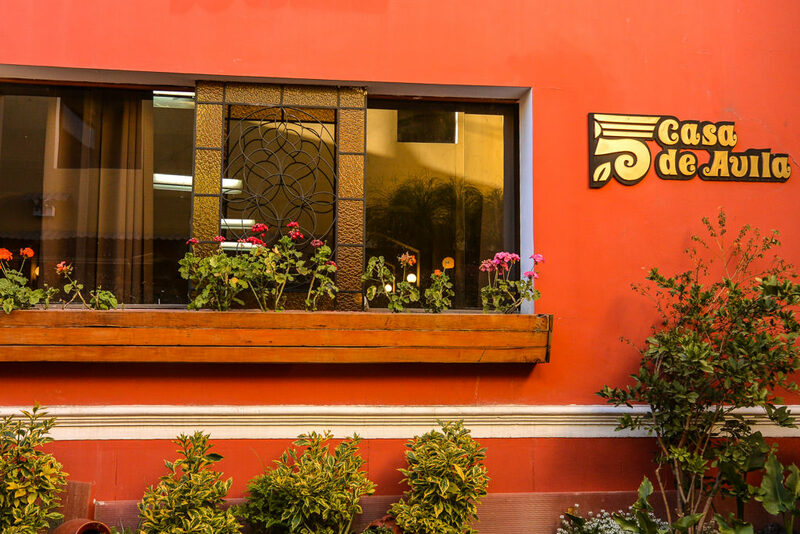 It was a popular choice with other PeruHoppers like myself who were not after a party atmosphere, and who wanted a comfortable, cozy, private room in Arequipa that doesn’t break the bank. 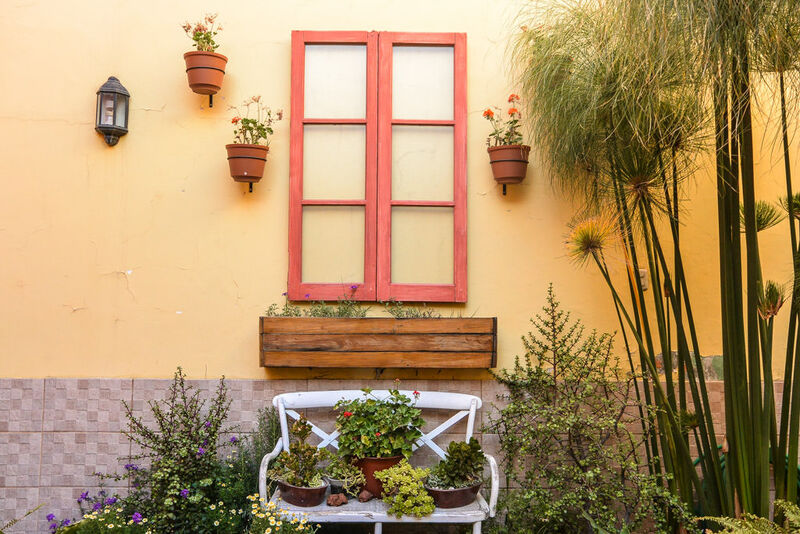 Casa de Avila is a small, locally run hotel that offers the coziest boutique style, in the perfect Arequipa location. Casa de Avila is probably most famous for its incredibly friendly staff. Everyone from the owner to the front desk staff to the cleaning ladies always had an authentic smile on their face and a warm greeting to offer. 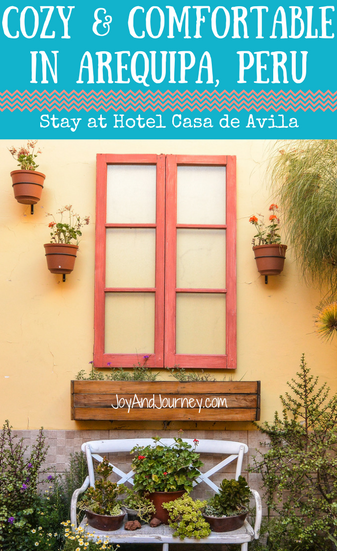 The opposite of what you’d find at a chain hotel, the hospitality at Casa de Avila felt genuine and truly welcoming. The staff are also absolute gold for recommendations (yes, in English as well). Whether you’re looking for fresh pastries or the freshest ceviche, they will point you in the right direction! The receptionist staff and the owner of Casa de Avila himself are all serious Arequipa experts, and offer a wealth of information about the city. Whether you need help, advice, or suggestions – don’t hesitate to ask. The hotel offers occasional cooking classes that come highly recommended – be sure to ask at the front desk for more information! Casa de Avila’s common areas are absolutely gorgeous. There’s a beautiful garden that is the perfect place to sit with a coffee or a book, and just relax and enjoy. Casa de Avila Arequipa: Location, Location, Location! It’d be pretty hard to find a more perfect location in Arequipa. 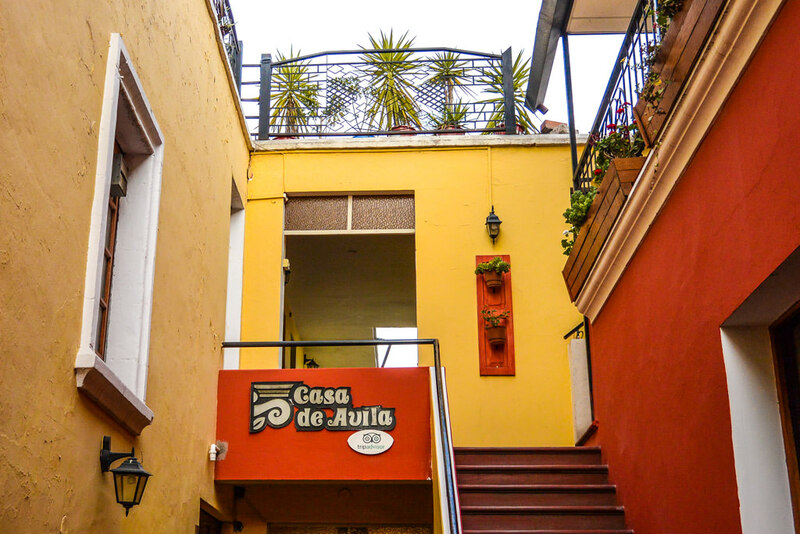 Casa de Avila is 4 blocks from the main square, and even less from La Merced, the River, and the Main Market. I honestly wouldn’t have preferred the hotel to be any closer to the main attractions. At night, the hotel was so quiet I could’ve mistaken myself for being in my childhood home in the countryside. Pure, beautiful silence in a cozy, colorful oasis! Casa de Avila Arequipa: Incredibly comfortable! Because I was dealing with altitude sickness, I felt like absolute crap and spent a lot of time in my room. Thankfully, it was perfectly appointed and beyond comfortable and cozy. The room was well-furnished, with a big bed (and tons of blankets and pillows), a convenient desk, and even an armoire with a TV. The hot, steamy shower was VERY appreciated, both to soothe the sting of the cold and to calm my throbbing head. I loved the variety of textures, and the warmth of the many blankets. The pillows and the mattress were soft without being too pliable. I had the perfect and very needed night’s rest. The wifi connection in the room was also very strong, which was perfect for laying on my bed and connecting to my email without needing to go to a common area or reception, which let me catch up on some emails while still taking it easy. Of all the hotels I stayed at in Peru, I think Casa de Avila takes the cake for security! It’s one of the safest places I’ve stayed in the world for a solo female traveler, from a physical security perspective. The room locks look incredibly sturdy, there is someone manning the front desk (or nearby) 24 hours a day, and the outer gate is locked at all times. All of the guest rooms face the inner courtyard. When waiting for a bus or pickup, guests can wait on the benches the entrance area, instead of needing to wait on the street with all of your stuff (especially late at night or early in the morning). Additionally, I saw a lot of staff walking around at all times, which made me feel extra secure. Arequipa can get cold. I was a bit chilly in my room, and thankful I picked up a pair of thick socks, as I normally travel without them. 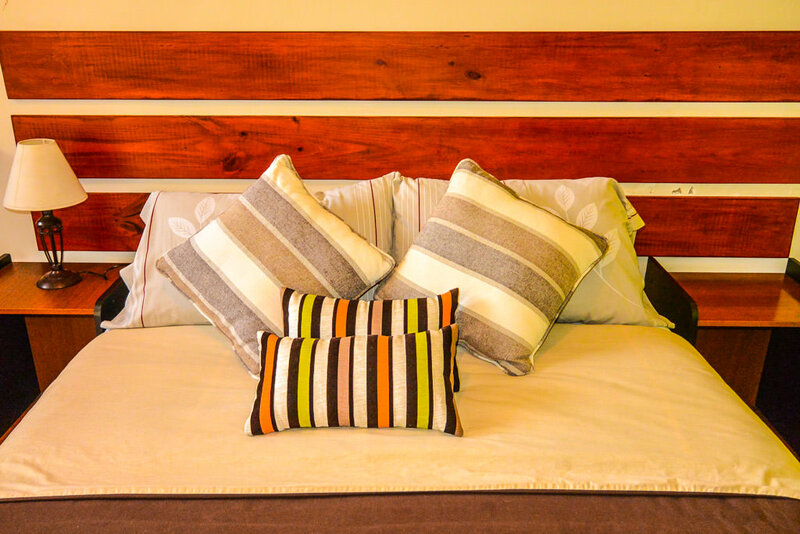 If you need extra blankets, you can ask at the front desk. While Arequipa itself has a lot to do, I would recommend staying a few nights even from a more pragmatic perspective if you plan to continue to Colca Canyon or Puno or Cusco. Arequipa is at the perfect elevation for acclimation, at just over 2300 meters. By spending a few slow and simple days exploring the city, you’ll be better equipped for the higher altitudes. I really, really wish I would have spent a few nights in Arequipa before continuing onto Colca Canyon and Puno, because I really think I could have circumvented the altitude sickness, or at least lessened the intensity, by acclimating a little. Early check-ins are a godsend when you’re stinky, sleepy, and cramped from spending a night on a bus. 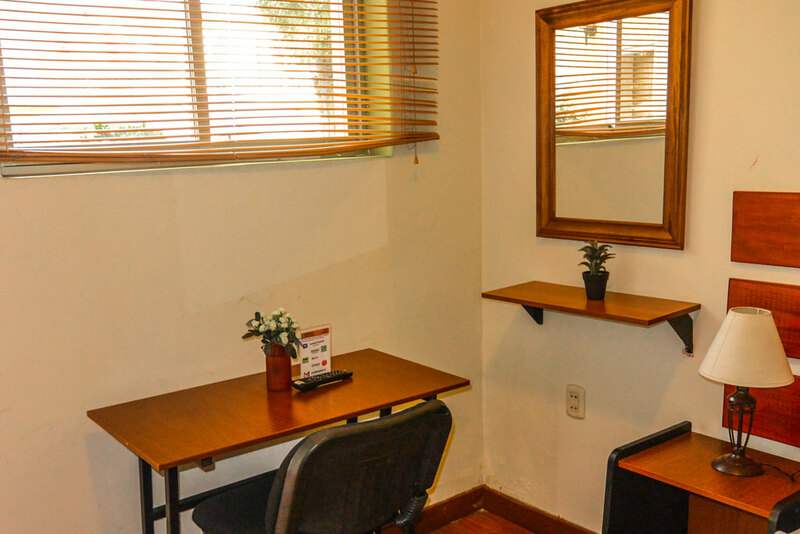 Casa de Avila offers the possibility for an early check-in based upon availability. 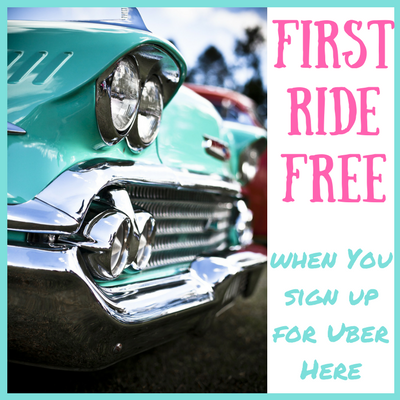 Contact in advance to set it up, and to confirm the fee. What do you look for in a hotel stay? I love small boutique hotels. If you are ever in Cuenca Ecuador look up The Casa Ordonez, run by Alberto Ordonez, a candidate for the nicest person in the world! You are the second blogger I know that has moved/lived in Puebla, Mexico. My wife is retiring next December. I’m already retired. We are looking at San Miguel Allende, Puerto Vallarta and the Lake Chapala area. Do you recommend we look at Puebla also, factoring in we need to be close to a major hospital? I have a heart issue. Thanks for your help. 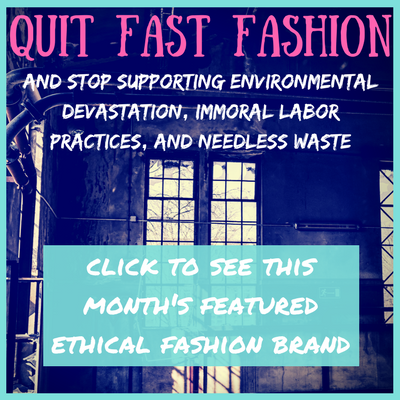 Great post young lady! Me, too! They’re my favorite type of place to stay! Thanks for the tip, I will definitely look up The Casa Ordonez when I’m next in Ecuador (love it there, definitely plan to go back). I like supporting nice people even more than I like visiting boutique hotels, so that’s a double win! To be honest, Puebla wasn’t the first choice for us, it was for work. Both my husband and I are “city people”… and while Puebla is technically a city, there’s definitely not the same buzz or diversity as Mexico City (where we lived before moving here). That being said, I’ve really grown to love Puebla. Housing costs are cheap (we pay half of what we did in Mexico City, for literally double the place, in a very nice secured neighborhood: Lomas de Angelopolis), there’s a good feeling of community, there’s still a lot of options of what to do and where to eat… and there’s a direct bus to Mexico City airport (important for me, traveling a lot). It does feel very “suburb”y though, especially where we live in Lomas. I don’t even need to leave the secured community of Lomas to visit the mall (called Sonata, with 20+ restaurants, bars, shops, etc), get groceries, go to a VIP movie ($5 for your own lazy-boy seat and a waiter! I’m addicted), walk on hiking trails with my dogs. That could be a pro or con, depending on preference! Regarding your heart issue, Puebla has a great healthcare system and several major, world-class hospitals. Most of the doctors speak a high level of English, especially at the good hospitals. San Miguel Allende: Biggest complaint I’ve heard is high cost of housing (relative, for Mexico) and that there’s too many expats. Otherwise gorgeous city, convenient access to Mexico City. Supposedly many expats do not bother to acclimate to the local culture, for instance they don’t learn Spanish. Puerto Vallarta: Can get hot and humid. But a lot of people really love it. For instance, two of my favorite relatives (my aunt and uncle) just retired and bought a casa there. 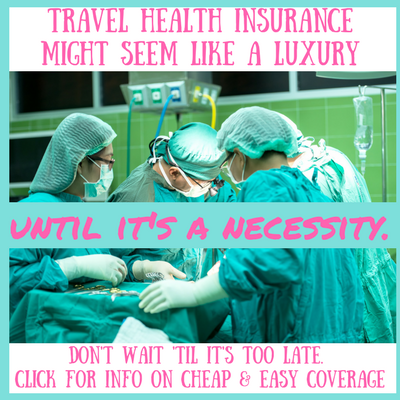 It’s also convenient if you plan on enticing family/friends from home to visit, as it has good flight connections to the US and is a major and inexpensive vacation destination. I’ve been twice. Lake Chapala: Lots of retirees, tend to be more longterm, other than that I haven’t heard much (and haven’t visited myself). Perfect weather, gets a little cold in the winter, gets a little rainy now (but usually only in the afternoon/evening, sun in the morning through lunch time at least), but usually mild and sunny. Probably the best weather of ANYWHERE I’ve lived (I’m not really into humidity or intense heat… but I also don’t like snow and cold). Definitely an expat community exists in Puebla, including retirees, but from what I’ve heard, smaller than the other places you’ve mentioned. I’ve had a much harder time meeting people and making friends here than in other places I’ve lived (rio de janeiro, bangkok, mexico city), I think due in large part to the fact that my Spanish isn’t tip-top so Poblanos don’t want to hang out with me (understandable) and there just aren’t that many expats, especially in a similar situation/demographic. I find that a high level of Spanish is very necessary here for day-to-day things, like if there’s an internet problem, signing a lease with a landlord (none that we’d met with spoke English), talking to the security guards, etc… much more so than in Mexico City, where people seemed to be more understanding/helpful/used to dealing with second language speakers. While I’m still learning Spanish, my husband is fluent, and I’ve had to rely on his help in a lot of situation, even calling and having him talk/explain for me, because my Spanish wasn’t competent enough. 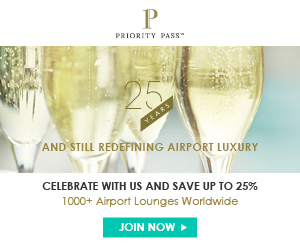 All in all, though, I find that the weather, cost of living, quality of life, and convenience to a major airport really make it a great choice, at least for us.